Basaseachic Falls tumbles over 800 feet (245 meters) into an unspoiled canyon in a sight that, for me at least, was simply inspirational. 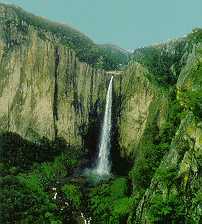 Creel in Chihuahua's Copper Canyon region provides the center of a great vacation or even long week-end from the U.S. Southwest. Particularly fun if you take a sports touring motorcycle as I did. The Copper Canyon Railroad ride is one of the world's most scenic. From the U.S. you should be able to contact Mexico by Rail at 800-228-3225. Thanks for the picture to The Bird and Esteban Turati.